Har Gau is probably the most common dim sum beside siu mai all over the world. The translucent pastry and yummy prawn filling are so inviting and absolutely lovely to eat. Not too difficult to make all you need is the right flours, both available from any chinese supermarkets. See first picture on the following link. Mix all the ingredients for the filling, leave in the fridge for 1 – 2 hours. Mix the two flours and salt in a mixing bowl. Make a well and pour in the boiling water, mix. Then mix in the lard or oil. The pastry should be quite lumpy, don’t worry. Leave it to cool a little. Rub a thin film of oil on the working board. Scrape the pastry onto the greased area. Rub hand with a little oil too. Knead the dough till smooth. Roll into a rod shape about 2 cm thick, mark equally and cut into 16 – 18 pieces. Each piece around 13 – 14g. Put pieces into a bowl cover with cloth. If there is any dough sticking on the working area, scrape that off. Grease a small area of the working area with a very thin film of oil. Take a piece of dough roll into a ball between your palms. Then press into a disc and roll it out on the greased area. See picture for the wrapping technique. Cover the completed dumplings till you are ready to steam. Can leave in fridge for few hours if you are not ready to eat. Steam at high heat for 4 minutes. Eat while hot on its own or with soy sauce or chilli oil. Sunflower, these look lovely. I adore dumplings. You are so talented. Have you ever thought of starting a class? That would be the only thing which would drag me up to London these days. They look very professional. Thanks for posting the recipe, i'll be sure to try it if I can find the flours. Love to teach you or anyone. I don't live in London, used to. I am in Cambridgeshire. I live on the South Coast Sunflower - what a shame. I bought the tapioca flour today but forgot the wheat starch. I am lucky as my local Asian shop sells ingredients from many different cultures. I aim to make them next week. Many thanks for posting this recipe. You are great! Dim sum is one of the most difficult to make. Very Pro! Congrats! Wheat starch is a must to give it the translucent look. Glutinous flour don't work with this recipe, it will be sticky. 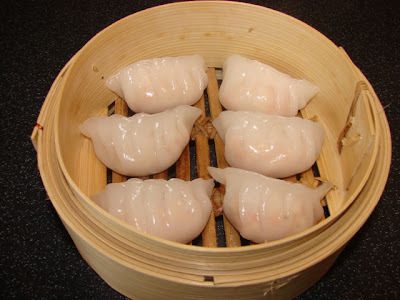 If you have bought it I am going to post some glutinuos flour dim sum in due course so you can use it up. For tapioca starch, if you don't have it you can use potato starch. Good Luck, any problem give me a shout anytime. I will be looking out for you. Don't forget to take pictures! Thank you for the recipe, I will try make them!! I have a flour called Fang Bian Mi Fen. Unfortunately there I can't remember which one it is and can't read chinese. Can you tell me which one it is. Thanks. Your recipes are excellent by the way!!!! Can you take a picture of the packet and post a link so I can read the Chinese characters. I don't know what are 'Fang Bian',I guess 'mi fen' is 米粉 i.e. rice flour. The one on the left doesn't say what is it just a brand name meaning 'Sunshine store'. Are there any more writing on the back/side and what are the writing on top of the packet can't read from the photo. Ok the photos of the front and back of the package are there on the same link. The writing at the top is just the name of the supermarket brand, but I believe this is potato starch/fecula de patata. 3rd photo the chinese words here just means 'starch' think you may be right it's potato starch. The main ingredient for the pastry is another starch from wheat called tang mien or in chinese 澄粉 (to read these two words use character encoding,Unicode (UTF-8) or see the 1st picture on the slideshow of this post. Take the chinese writing or the picture and show it to the Chinese grocery store, you may find the right type of flour. If you use all potato flour for the pastry, it can be chewy. Oh so it's back to the shop! Thanks again. So, with the plain rice flour I can make cheung-fan! Hope you'll put a recipe for that!!!!! I love cheung-fan. Hi,Thank you for posting this recipe!I've bought a packet of corn starch insteaed of wheat starch. Can i use corn starch to make the pastry? Corn starch does not give the crystal look and texture like wheat starch. Your Har Gau look great! Professional even! Can I ask what Tapioca flour is in chinese? I have a recipe for vietnamese Banh Cuon (like chinese cheung-fun) that states it in the recipe but I'm not sure what it is? If you can't find tapioca starch potato starch is fine. My dumplings end up gray color, not white like yours. And very chewy. What am I doing wrong? Please help. Did you use the right flours? Both wheat starch and tapioca starch are pure white, the resulting dough should be quite white. How did you mix the flour hope by hand not by machine, if machine the dough may be stained by the machine's contaminant. Dough too chewy, may be type of flour you used, or did you not cover the wrapped dumplings during wrapping to keep moist. Next time can try add a bit more boiling water to mix the dough.